The great thing about this patio is that you really don’t have to worry too much about the weather when you’re here (unless it rains). Reason being: the surrounding shipping containers serve as a weird sort of protective device against the weather. So, regardless of whether you’re trying to temperature-control yourself by beating that unseasonal June chill with Gonzo hot chicken and a deep-fried sweet potato pie, or alleviating a heat stroke in April by sipping on a milkshake and/or Champagne, you’ll be comfortable. Part bar, part restaurant, all neighborhood hangout, The Hub Louisville has it all, including a primo patio space that's decked out with fire pits, a great menu of brunch cocktails, and a large selection of bar items (which you're urged to try yourself rather than see online). Our pick is the Butchertown Swizzle: a lovely, layered cocktail made with Copper & Kings apple brandy. The latest undertaking of veteran Louisville chef John Varanese, Levee at the River House is a bar, music venue, and small bites restaurant attached to River House Restaurant and Raw Bar (another Varanese venture). The view on the patio is simply breathtaking, and the frozen craft cocktails will really hit the spot on those long summer nights. Grind Burger Kitchen started off as a plucky food truck with one of the best burgers around Louisville (seriously, trust us): the B&B, housed with brie, bacon, and hot pepper jam. From the beginning, owners Liz and Jesse Huot had a commitment to serving only truly excellent and well-executed food, without cutting corners, which helped set the bar really high for the Louisville food truck scene. It's since become a brick-and-mortar restaurant, now in NuLu, with a great back patio and full bar. This Mexican street food-inspired concept is from the same restaurant group that brought us Doc Crow’s Southern Smokehouse & Raw Bar Downtown. (Fun fact: it used to be Waterfront Tumbleweed.) 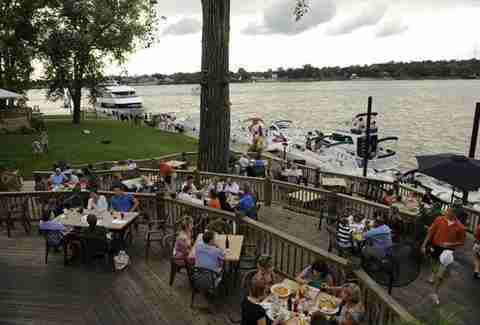 The outdoor seating area boasts a splendid view of the Ohio River, making it a comfortable place to spend a night surrounded by some drinks and friends. 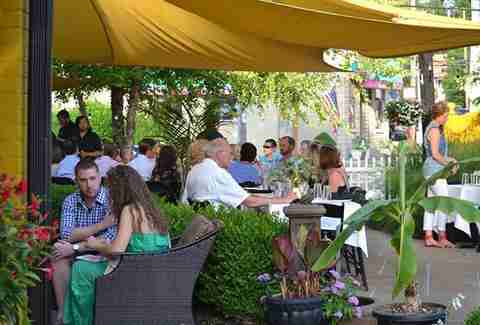 Bristol’s Downtown location has an incredible vine-covered hidden side patio. It’s the perfect spot to savor the restaurant's excellent Sunday brunch buffet, which includes a Bloody Mary bar. It just isn’t summer until you’ve played a game of ping-pong on those light-up tables while your friends watch, lounging on faux-turf benches and sipping basil gimlets. 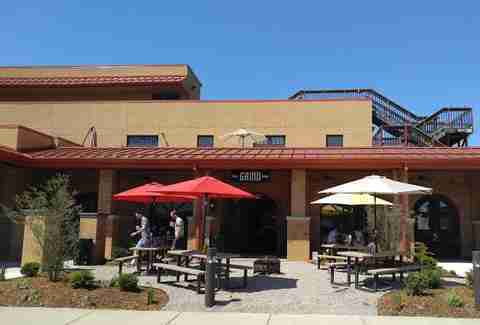 The decorative remnants of the renovated service station and Garage Bar’s wood-fired pizzas complete the outdoor dining experience. The beloved brandy distillery gets double credit on this list -- for the front deck where it hosts parties among renovated train cars and a reflection pool that showcases its gorgeous copper stills; and for the beautiful top deck, which can be rented for events and has a perfect view of Louisville. New York-style slices on the porch of an old VFW post... what could be better? Oh right -- melted cheese, frothy brews, and hipster-watching. OK, count us in. 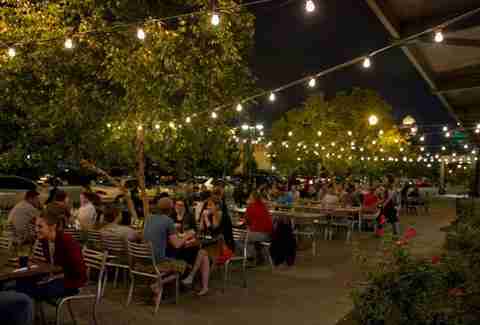 Roux’s front patio is spangled with lights and often alive with brassy jazz. Eating on the patio at Roux is the closest thing you can get in Louisville to that reckless, breezy NOLA feeling -- plus, the beignets are legit. Drinking on the back patio of The Village Anchor (the downstairs bar, attached to the porch, is called The Sea Hag) feels like living in an F. Scott Fitzgerald novel -- Gilded Age decadent, with undeniable class. If it’s too loud... you’re at the right place. The Silver Dollar (located in a renovated firehouse) is known for loud honky-tonk and whiskey by the drink, and the Christmas lights décor extends to the back patio. Johnny Cash, Four Roses neat, and warm breeze -- sounds perfect. 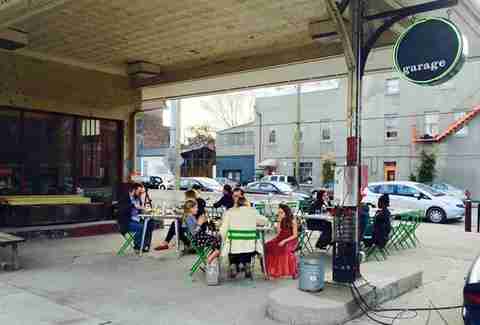 The only below-ground space on this list, Down One’s covered seating area is ideal for dining outdoors on a day when it just might rain -- which is a lot of days in Louisville. Also, there’s a photo op where you can position yourself under a giant (sadly, fake) splash of bourbon. Dude, El Camino really brought surfer coolness to Kentucky. Tiki drinks by a fire pit overlooked by a peppy mural of dancing island skeletons? Yes, please. 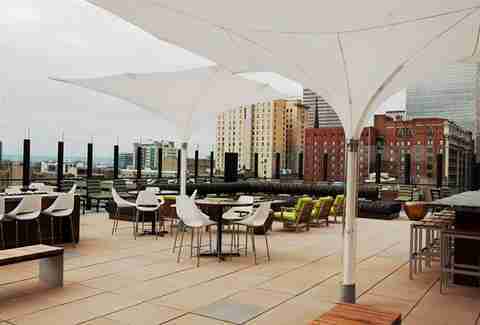 8UP’s rooftop bar is a multi-seasonal destination with fire pits and an incredible view of downtown. It's a great summertime visit, especially when pairing some drinks with the fried calamari, Korean style wings, or those delicious house cut fries (which come with parmesan and kimchi ketchup). Nach is a beloved dive for many reasons (RIP Magic the cat!) but chief among them is the comfortable back patio. 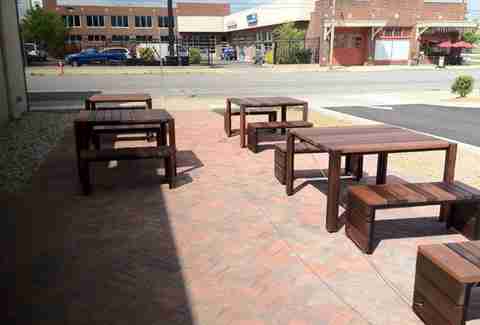 The long picnic tables foster conversation, and it doesn’t take too many visits to Nach’s patio to make you a regular. Beautifully decked out with strings of lights and trellises of climbing greenery, the garden that connects Holy Grale and Gralehaus is truly a sanctuary in the Highlands -- which makes sense, since Holy Grale used to be a church. North End Cafe is a great bet for an outdoor brunch, but better get your name in early because spots fill up quickly on the weekends. If you want the best vegetarian biscuits and gravy in town, North End is your go-to. 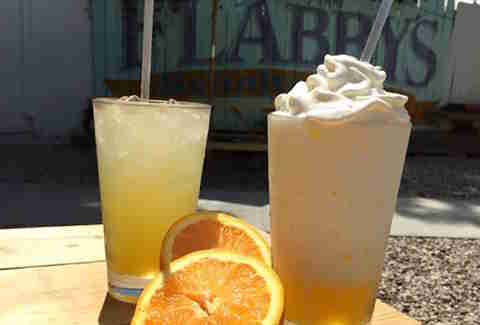 It’s not really spring until Dairy Kastle opens, and you get to order your first Orange Cow (orange sherbet mixed with Sprite or vanilla ice cream) of the season. Only the very lucky snag the few seats outside Dairy Kastle, and the rest have to make do leaning against cars or even sitting on the church steps across the street. Worth it. Captain’s Quarters has a sprawling multi-level deck and a great view of the Ohio River. 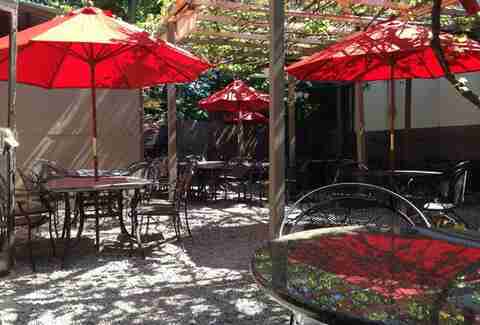 The Grape Leaf’s patio is incredibly aesthetically pleasant -- bright-red umbrellas, vines twining around trellises, a charming little fountain. 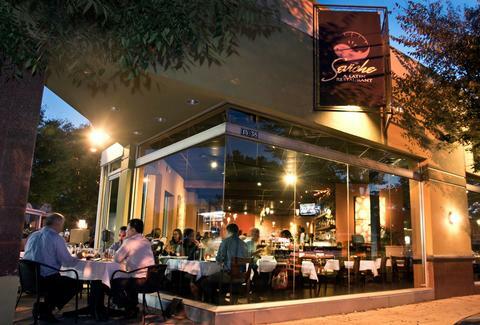 Seviche’s patio gives diners a front-row seat to one of the most exciting stretches of the Highlands, perfect for people-watching. Also perfect for patio consumption: Seviche’s famous avocado dessert -- avocado ice cream in a chocolate shell with a bourbon truffle “pit” and dulce de leche. Eating on Lydia House’s little patio feels like eating in a friend’s backyard, in the best way possible. It even kept the fence mural advertising “Flabby’s,” a previous restaurant in that space. 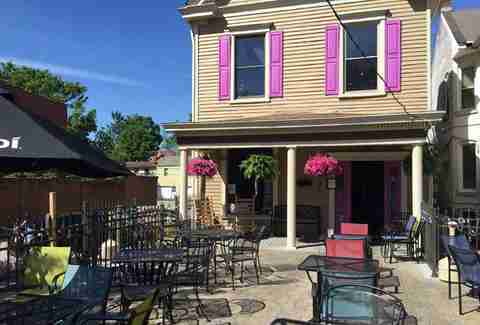 Decca’s patio is a pocket of zen in the midst of the East Market Street hustle and bustle. The water feature is especially calming. If you start your night with a meal on the patio you can finish it with a drink in Decca’s cool, rock-walled cellar. 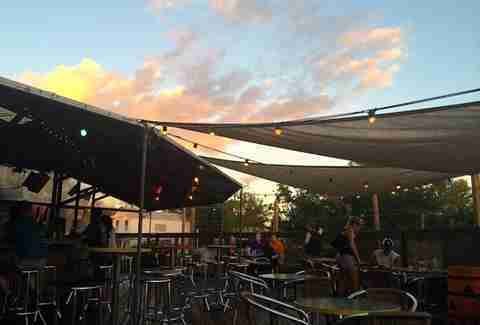 The Monkey Wrench’s rooftop bar is the perfect low-key stop for some Lil Cheezers grilled cheese and a drink after an evening of prowling the Highlands -- or just a rough day at work. Craving sushi late at night? BARcode 1758 has you covered. The outdoor space is actually larger than the indoor space, and is festooned with lights and multicolored screens. 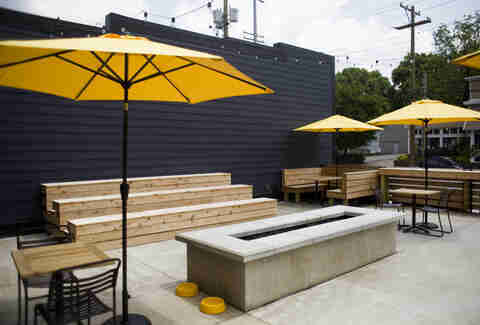 BARcode also specializes in shareable food served on skewers, so the picnic spirit prevails. Beer lovers: this is your front porch. 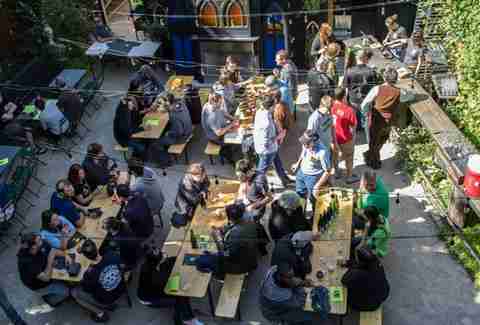 Visiting Against the Grain and sitting out front is a good way to quickly acquaint yourself with one facet of the rich craft brewing scene in Louisville. The first indication that Joy Luck isn’t your run-of-the-mill pan-Asian restaurant is the sign board, often deliciously snarky, “Open! Have your awkward Tinder date here!” or “Who needs cuddles when you could have bourbon?” Joy Luck’s Taiwanese food is complemented by its carefully curated cocktail menu -- particularly refreshing under one of the scarlet umbrellas out on the patio. 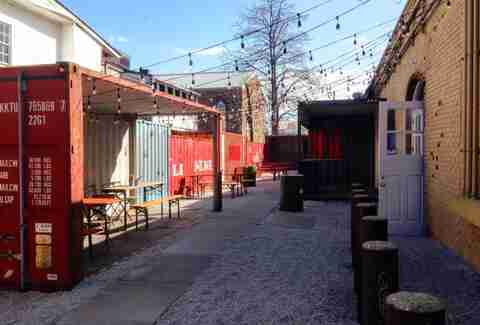 RYE’s patio is so expansive it's able to host a series of concerts in the summer (RYE’s Back Porch Sessions) and even a Buti and Bubbles yoga class. A classic, long-beloved Louisville restaurant, Ramsi’s is known for its Sunday brunch buffet and giant multi-culturally-influenced menu. 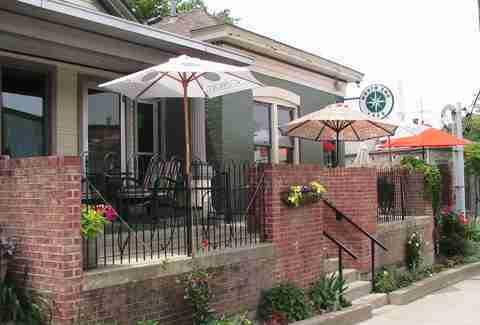 Anyone can find something to eat at Ramsi’s, and everyone can enjoy the breezy front patio. El Mundo is a not-so-well-kept Louisville secret -- it’s very small, and people will wait forever for a table. 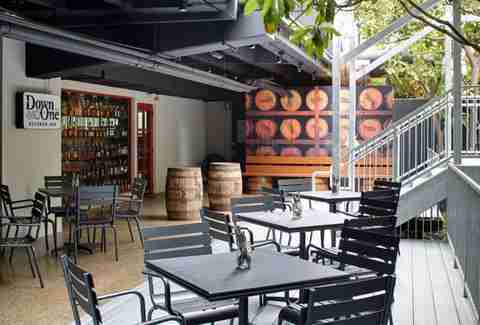 Sipping a margarita or a blood orange martini on El Mundo’s patio, behind the vine-covered privacy fence, feels like your induction into a secret club. Bistro 1860’s patio is so delightful it's planned a series of garden parties to celebrate it -- featuring food prepped on smokers and an outside grill. Even if you can’t make a garden party, make it a point to dine outdoors at Bistro at least once, it’s a no-fail first date spot. The New Albany location of the Comfy Cow has a rainbow mural on the back patio featuring grinning ice cream cones and treats. It’s like sprinkles on top of your outdoor ice cream-eating experience. Elizabeth Myers is a writer based in Louisville, who believes in brunch outside, with Champagne, whenever possible. Follow her on Twitter, Instagram, and Snapchat @Louisvillenoms.